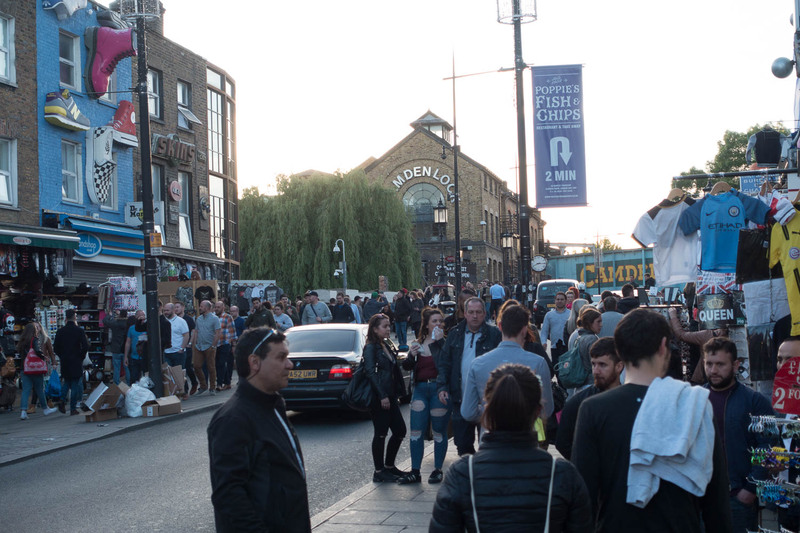 We barely have a spare full day in London (dang work) but we do manage to squeeze in most the stuff on our gimme-eat-list. Most of our travelling takes place in Asia so we are not accustomed to being in countries where we can actually speak the language. It's weird. 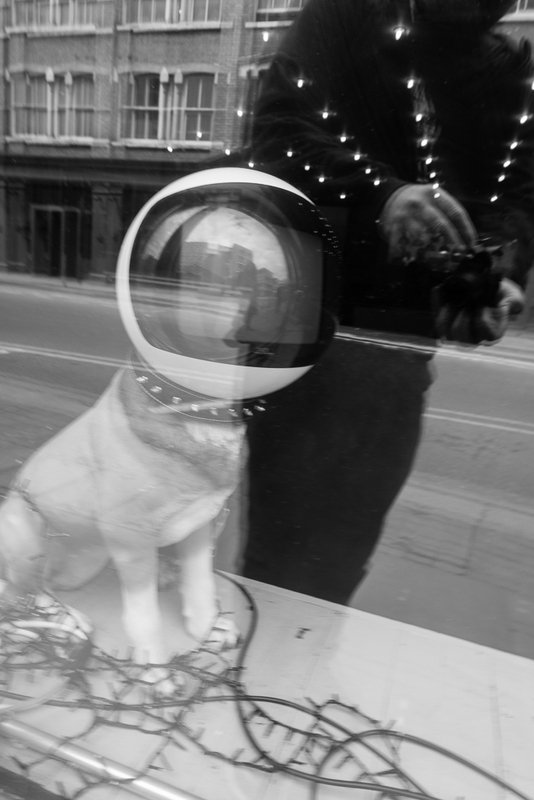 Parallel universe weird. What we gain in convenience we lose in freedom to express our inner idiots. We felt oddly self conscious doing the little things like ordering coffee or a beer. Maybe we were just overthinking it. Or maybe it's the jetlag talking. We're in bed by 7pm and waking the roosters up at 5am. Our rental apartment has the thermostat stuck on thirty degrees celsius, it's like Texan summer in here, the dry heat dehydrates us to the point of nose bleeds. We lounge around the apartment in our underpants and sweating while commuters outside our kitchen window are rugged up like Inuit. So yeah, our time in London was a weird few days. But we like weird. Our numero uno London food box to tick was Jamaican food, something we don't really get back home in Sydney. 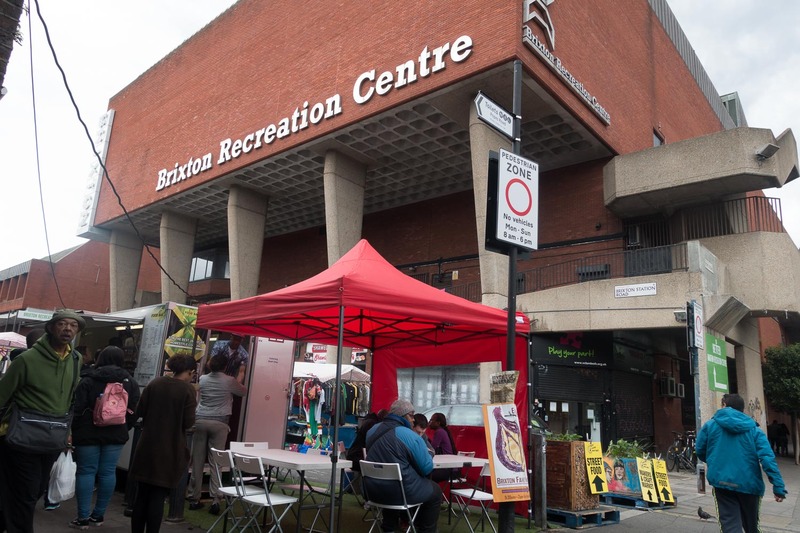 So we bus it to Brixton. We sniff around the markets and quickly settle on the Jeff the Chef food van. 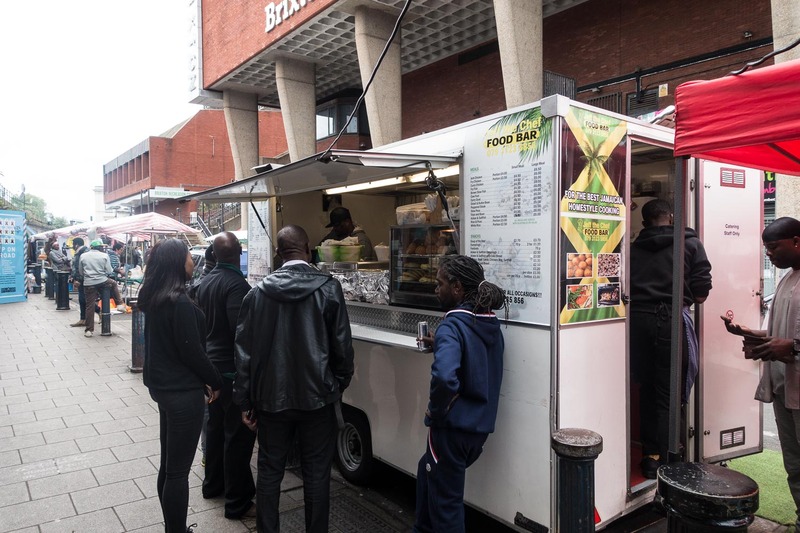 A food van with covered seating - bargain! 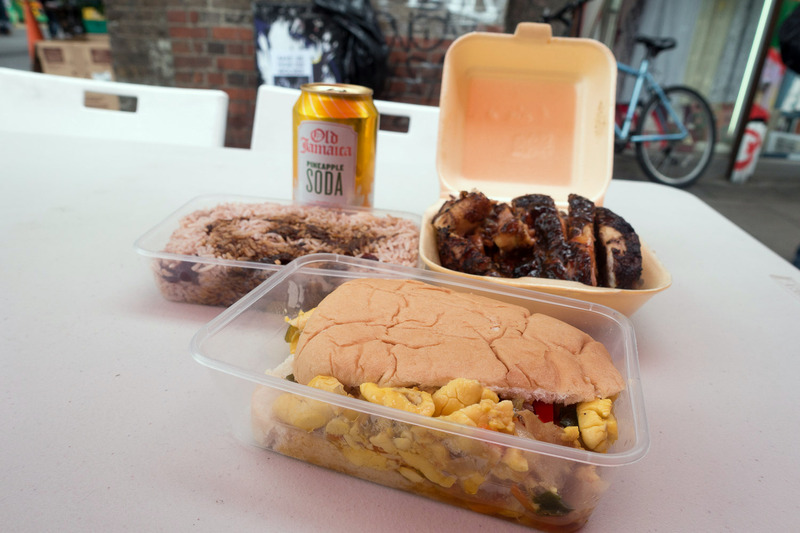 A Jamaican feast for a measly eleven pounds, joy! We get two meals out of this. 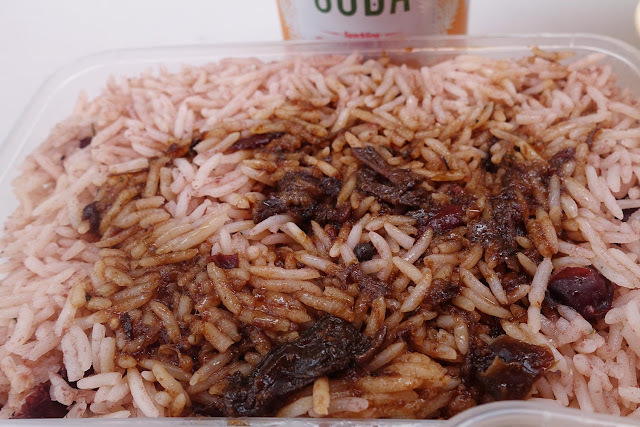 Rice and peas - Google tells us rice and peas is made by boiling up kidney beans with garlic, thyme and coconut milk, with the rice added at the end of cooking. Might try this one at home. 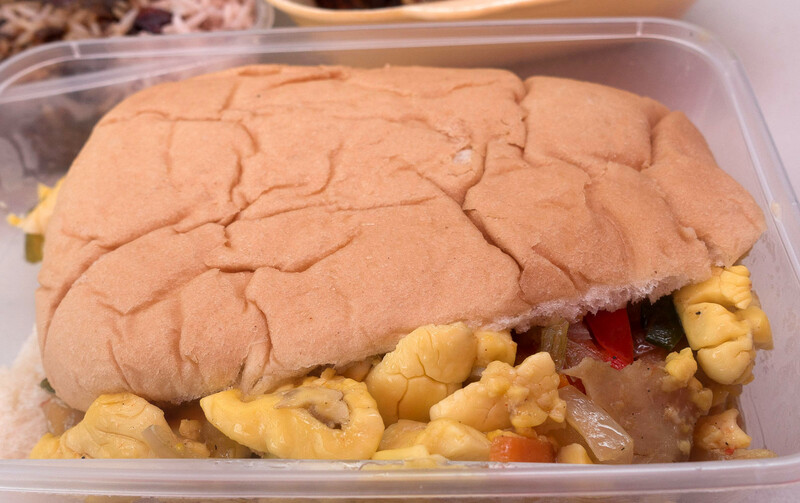 Ackee and saltfish with coco bread - gentle and homely. 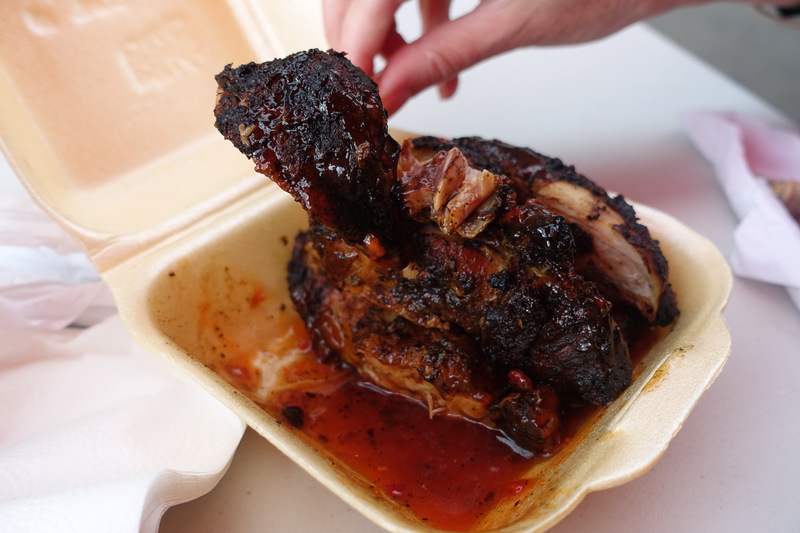 The jerk chicken is sweet, moist and charcoal-y. 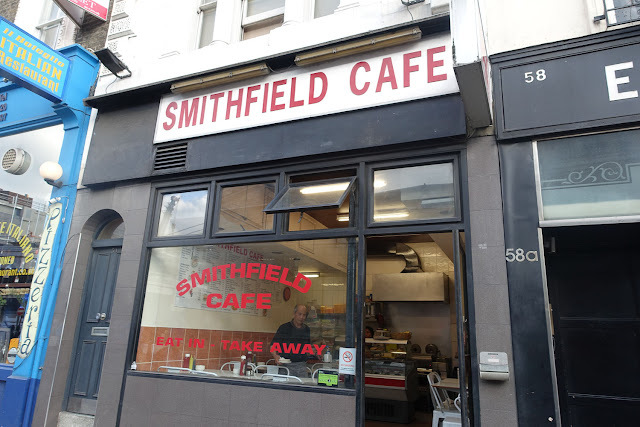 It surpasses some almighty expectations, even though Jeff the Chef reckons it ain't quite the same now he can't cook it on the street due to complaints smoke and smell, it is cooked at home and brought in. 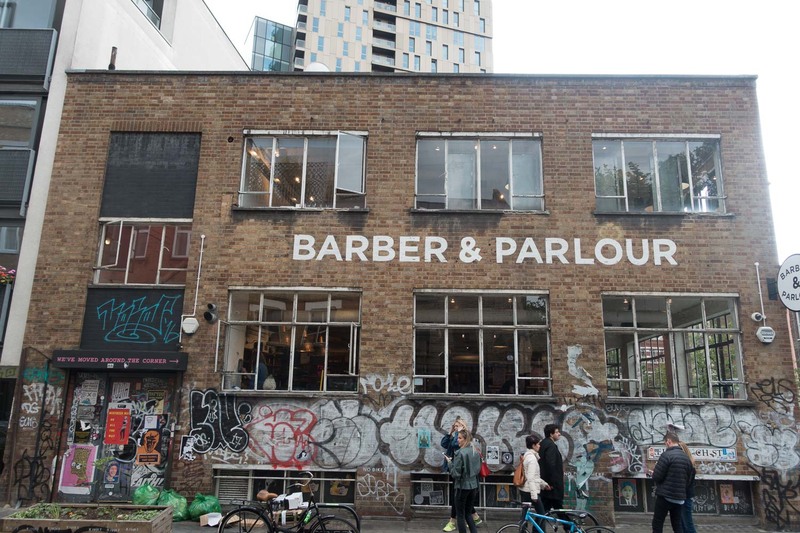 For the next food item on our agenda we head over to Shoreditch for some gentrified fun. We were given a tip on the bagel joints in Brick Lane. 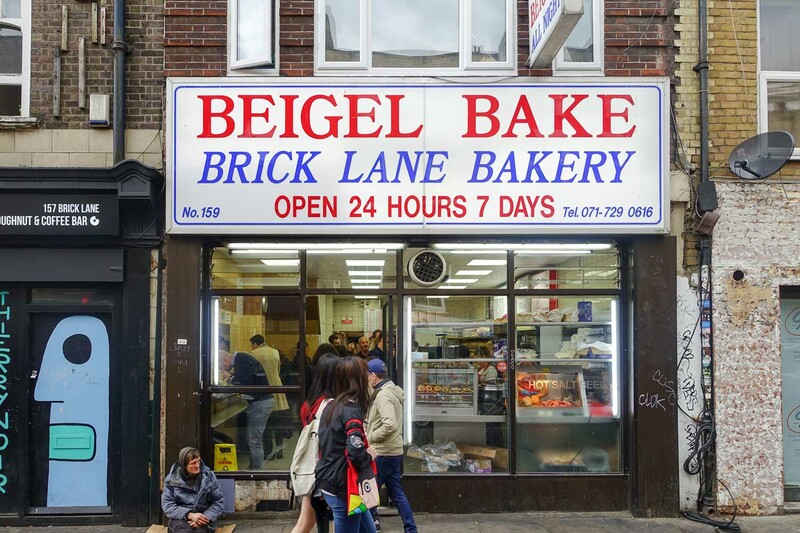 The crowds and the information superhighway suggested Beigel Bake bakes the best beef bagel in Brick Lane. Say that ten times. Beigel Bake is packed with punters and bagels, the sheer quantity of rolls and humans in this small shop is staggering. And it runs twenty-four hours too. 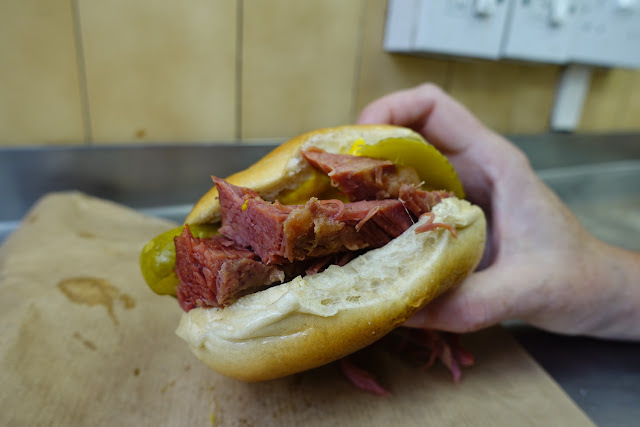 We go for the salt beef beigel with pickle. It's awesome. Loads of meat in big rustic hunky chunky hunks. Super fresh bagel. The pickle cuts the meat perfectly. Oh yeah, this is good. 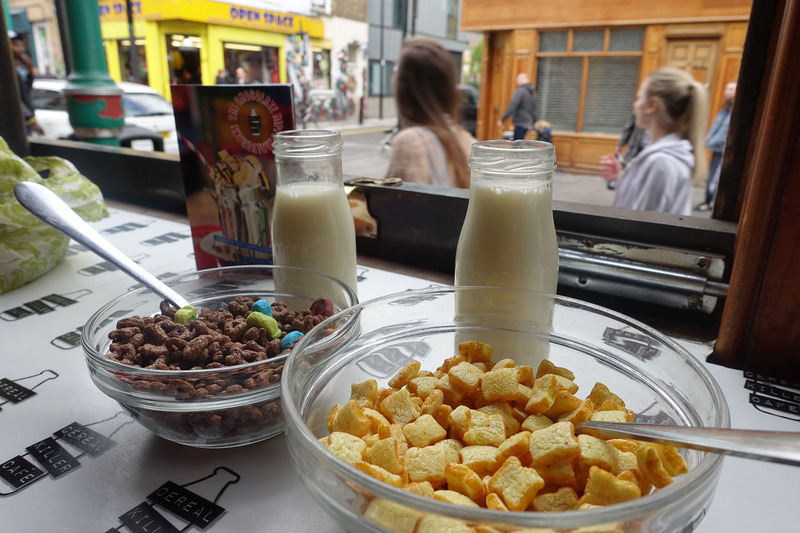 The real reason Shawn dragged Alison to Brick Lane is Cereal Killa, a cafe specialising in Mr Shawn's secret fetish - sugary breakfast cereals. 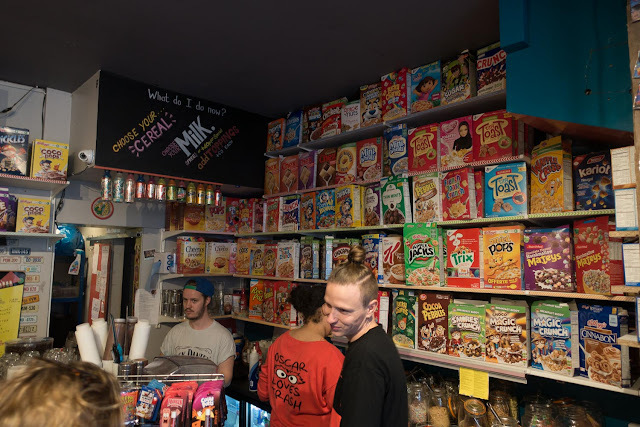 Being a sugar junkie with a Coco-Pop deprived childhood, Shawn has developed a deep and fine appreciation of breakfast cereals, especially American cereals, which are the pinnacle of high fructose corn syrup mastery. VHS cassettes are used as table numbers. Nice. Ah, our order! Shawn goes for the Cinnamon Toast Crunch, it's like a bowl of crunchy donuts. Alison makes the superior choice: Chocolate Lucky Charms, think Coco Pops with marshmallow. The marshmallow just pulls back on the intense chocolatey-ness, like a dab of cream in your chocolate mouse - dark and light, ying and yang, sugar high and diabetes. Chocolate Lucky Charms is the best cereal ever. There's dozens of cereals to choose from and a bunch of different milks to soak them in (regular, skim, semi-skim, flavoured etc) and you can even design your own cereal cocktails. 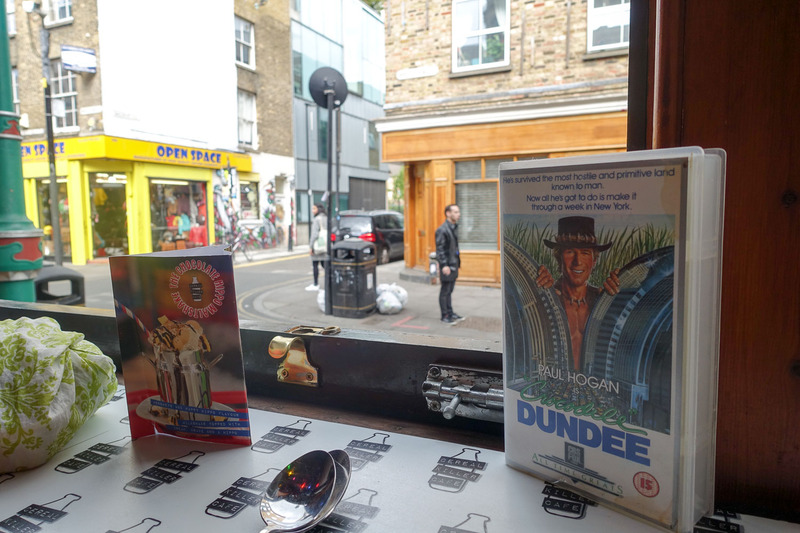 Our only regret is sitting by the window, for some reason eating breakfast cereal in a cafe attracts a lot of rubber neckers. 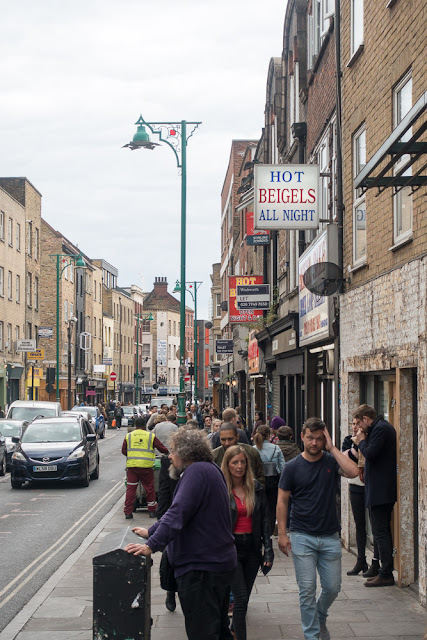 Brick Lane is famous for Indian restaurants, by far the best ones we saw were at the river/city end of the strip, some great looking hole-in-the wall joints. 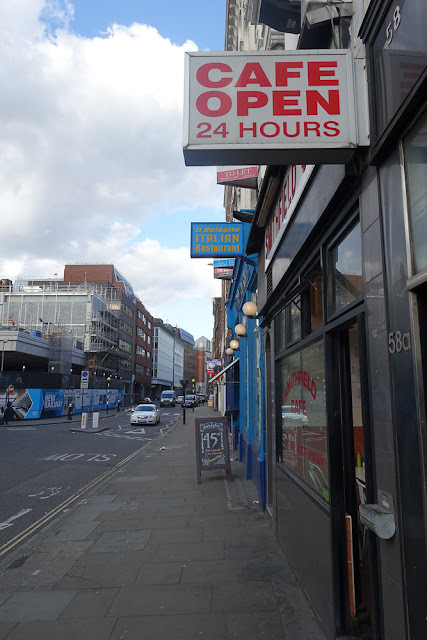 We did have curry on our London bucket list but it never eventuated, the late night curry joints we've heard so much about seem to have disappeared from the high streets we walked down, replaced with burgers and kebabs we guess. We did get some English Chinese in though, it's tops. Shortly afterwards we are walking along and Shawn's wandering brain suddenly wonders where in London one of his musical heroes, Mary Hansen of Stereolab fame, was killed in a cycling accident back in 2002. 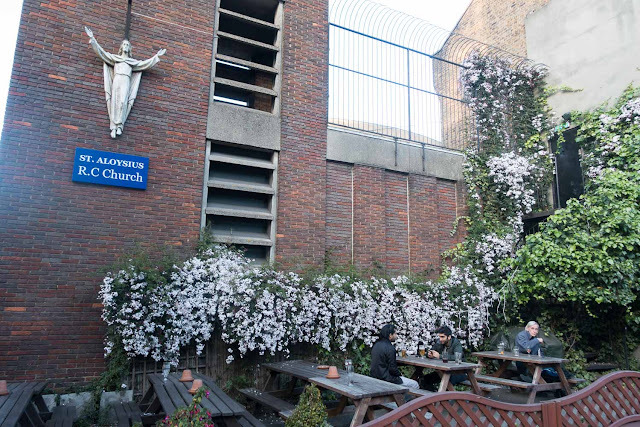 He stops and googles it, turns out Mary was hit by a tiptruck in Finsbury Square, right where we are standing. Spooky. Another London food bucket list item was the traditional caff, these are thin on the ground these days. 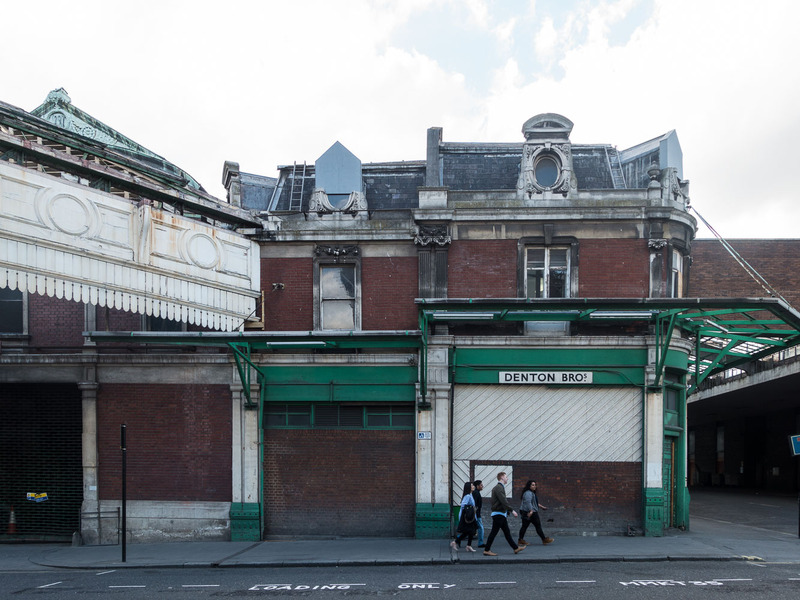 We spied Smithfield Cafe as we walked by the glorious Smithfield Market. It was run by a lovely auntie and uncle, we were pretty sure they were speaking Indonesian. 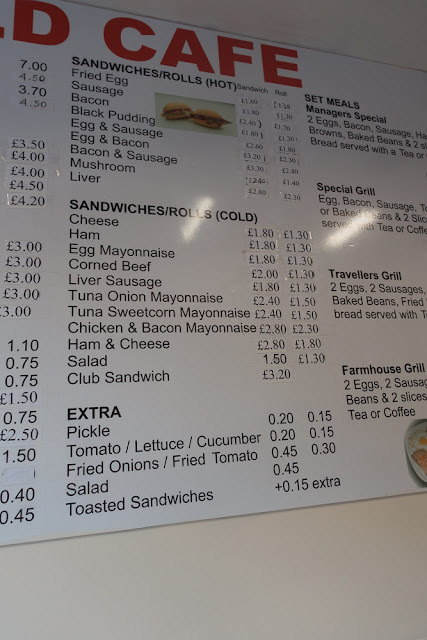 It's old fashioned food at old fashioned prices. When the boss added up the bill we were sure he missed a few things it was so cheap. Egg sandwich. 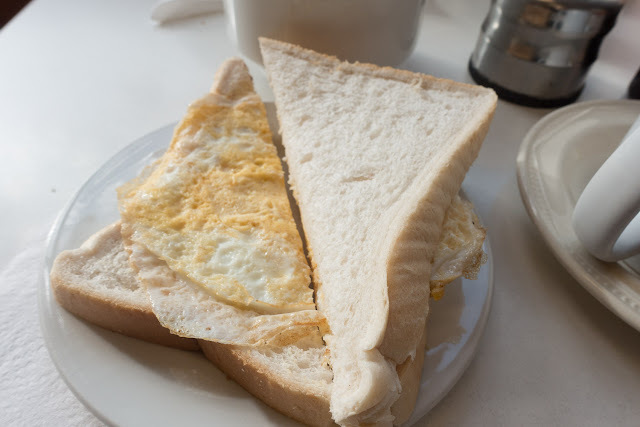 Shawn fell in love with the egg butty - he squeezed in a couple in this short trip - it's nothing more than a fried egg in cheap white bread, so simple but dang good. 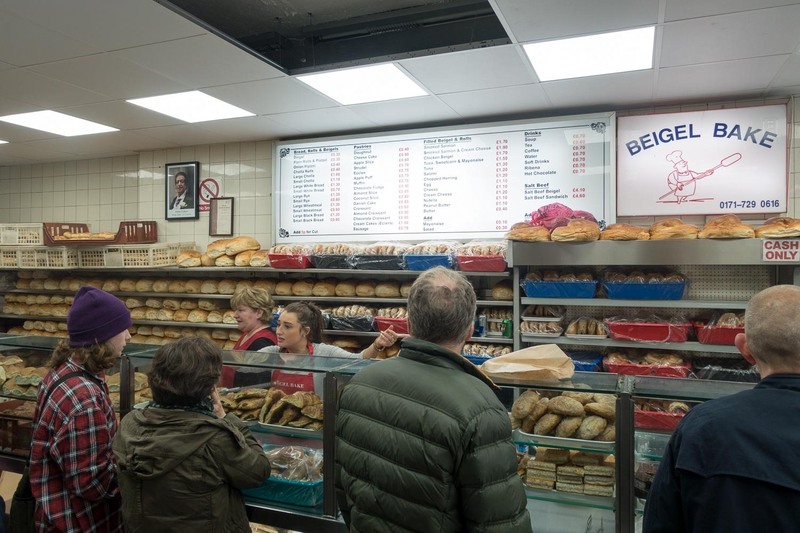 The egg is cooked just right - medium and moist, and the bread is super, super soft and super super fresh. 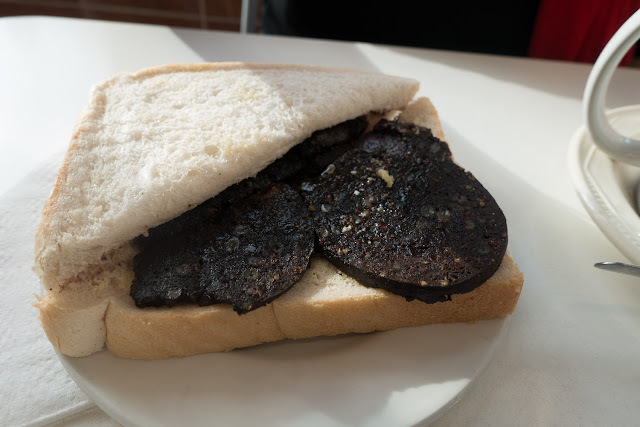 Black pudding sandwich is another masterpiece - the super fresh white bread is a perfect yang for some fried slices of black pudding. Yeah baby. 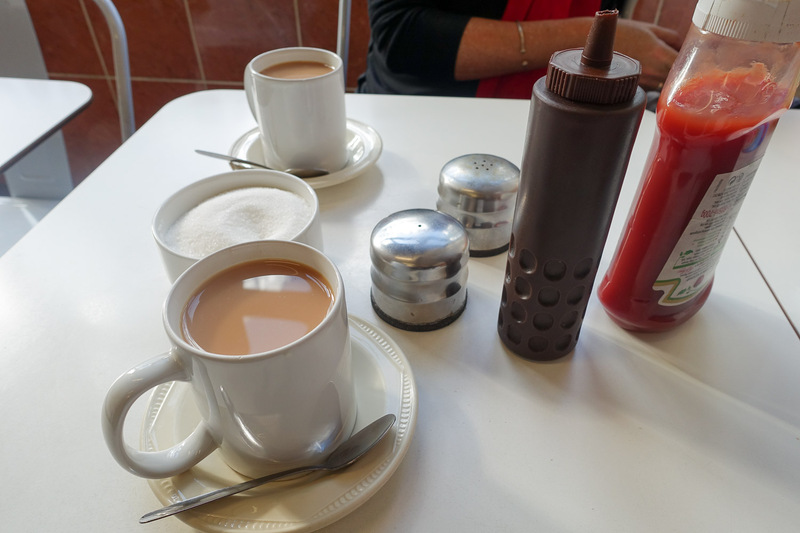 We felt lucky to have caught some caff food while it is still around. An odd and unexpected food highlight was a feed at Cafe 101 at Salvation Army International Headquarters, right in the centre of town next to Millennium Bridge. 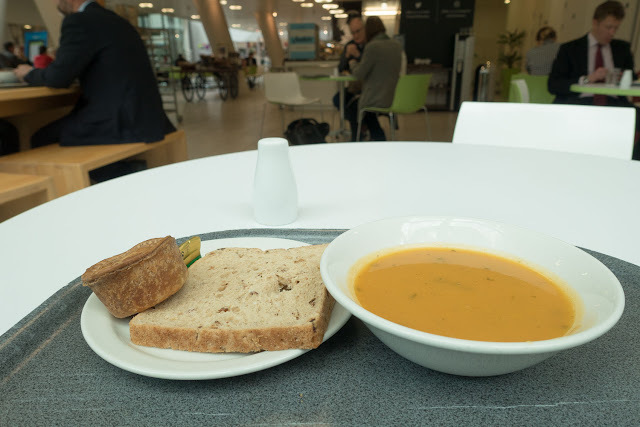 The food is excellent and it's cheap - carrot and coriander soup, bread and a pork pie cost not much more that a couple of pounds from memory. It's a modern, bright and cheery place that welcomes all - suits, bums, and Aussie tourists sick of seeing the same freaking five chain store restaurants over and over again throughout central London. We stayed at Chalk Farm which is on the edge of Camdentown, which is like Sydney's Newtown on horse steroids. It gets so busy on weekends they close the train station. Time for us to get out of here. 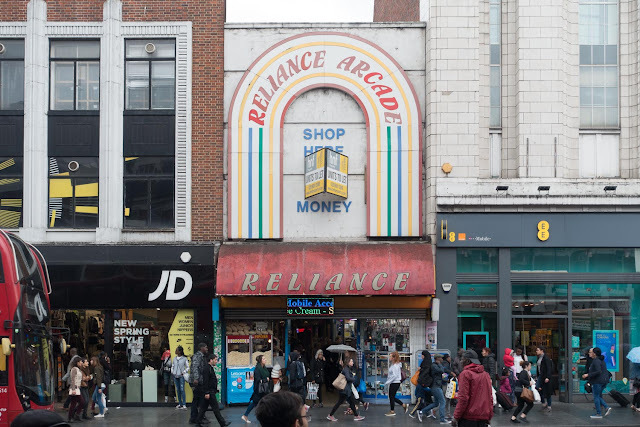 A few days in London was a nice taster. We wish we could get on a train to explore Ingalund but we have to get a plane to Phuket, it's a tough life. Glad you enjoyed your trip! As an Aussie who loves your blog (and now lives in London ) it is great to see you spreading your B-Kyu love. 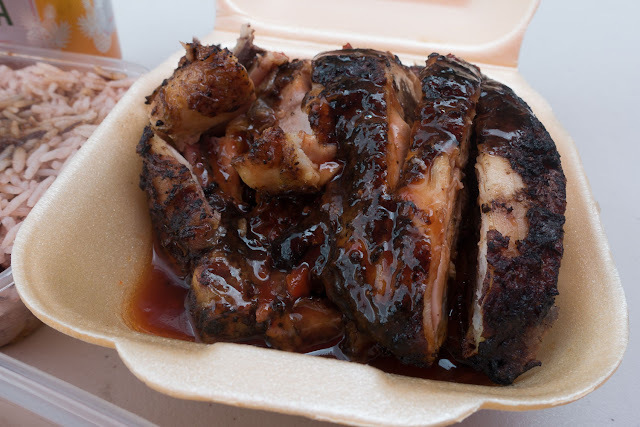 If you are ever back, take the Victoria line to Walthamstow Central (the exact opposite side of Brixton) for the best Jerk chicken of your life - Jerk Hut! Yeah we read about Jerk Hut - next time! JamVybz on Glebe Point Rd was a great Sydney fix for Jamaican food. 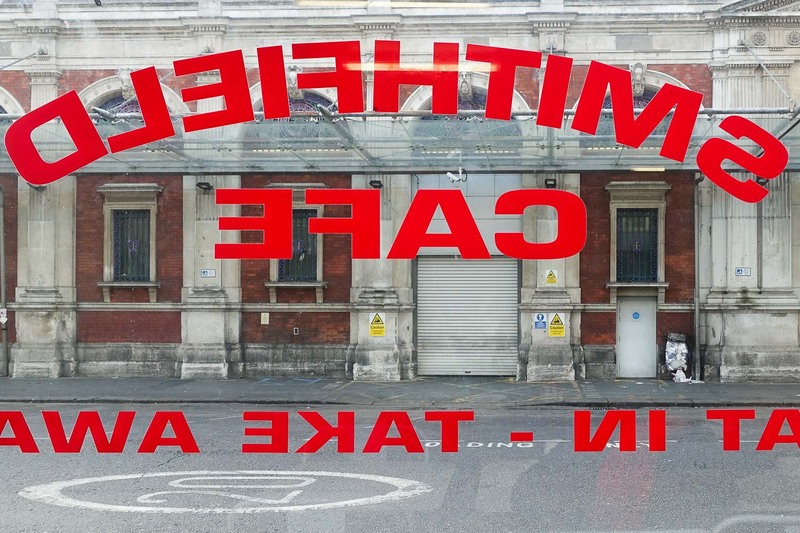 Unfortunately, it closed down. 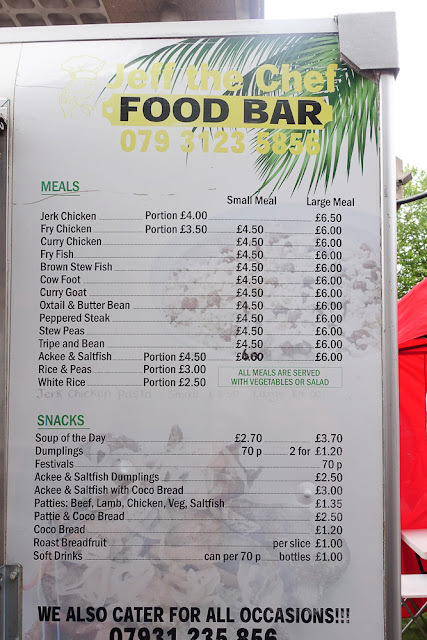 We regret not trying that joint - a Jamaican English friend of ours said it was the real deal.